We've reached the Holiday season - can you believe it? 2. Earn 300 SB total before 12/1. You'll get a $3.00 (300 SB) bonus for it! 3. 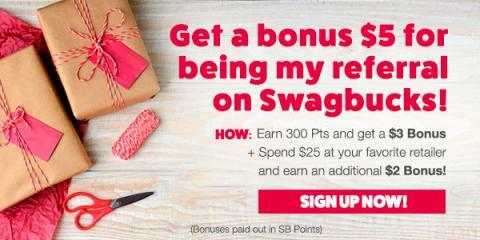 When you do your holiday shopping, spend at least $25 through Swagbucks Shop* and you'll get another $2.00 (200 SB) bonus on top of the cashback you'll get from shopping. That's it! It's super easy, and yes, Swagbucks is for real.